Life on Europa? The moon with life in a subsurface ocean? This moon of Jupiter might have life in a subsurface ocean. Life on Europa: Water from a subsurface ocean on Jupiter's moon, Europa, could reach the surface through seeps or erupt from hot water vents. This water would reveal the chemistry of the subsurface ocean and may contain microbes that live below. Artist's concept image by NASA / JPL. Subsurface structure of Europa: This image shows the internal structure of Europa. 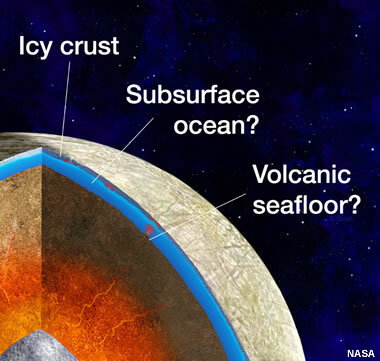 It has an icy crust supported by a subsurface ocean. Below that is the rocky layer surrounding an iron core. Image by NASA / JPL. For the past several centuries, everyone believed that Mars was the most likely body in our solar system to support life beyond Earth. But after centuries of telescope observation, decades of spacecraft exploration, and several robots exploring its surface, the promise of discovering life on Mars remains elusive. Now, scientific attention is being focused on Europa, the fourth-largest of Jupiter's 67 confirmed moons. It may be an even better candidate for finding life than Mars. For life to be present the three basic requirements are: 1) liquid water; 2) chemical building blocks; and, 3) a source of energy. Europa is thought to have all three. The surface of Europa is very cold and covered with ice. This ice forms a "crust" on the moon that is thought to be several kilometers thick. Beneath the crust, a subsurface ocean of liquid water up to 100 kilometers deep is thought to exist. Investigators believe that the ocean is rich in dissolved ions, particularly magnesium, sodium, potassium, and chlorine. Organisms on Earth live in ion-rich solutions, so there is a good chance that they live in them on Europa. Video: Europa - Cool Destination for Life, produced by NASA / JPL News. Spacecraft observations determined that the surface of Europa is covered with water ice. That ice and other materials on Europa's surface are bombarded with radiation from Jupiter that could alter them into some of the chemical building blocks of life. These include: free oxygen (O2), hydrogen peroxide (H2O2), carbon dioxide (CO2), and sulfur dioxide (SO2). If these compounds reach the subsurface ocean, they can be valuable nutrients to start and sustain life. The ocean water can react with the rocks and minerals of the subsurface ocean's floor to liberate other nutrients to support life. Video: The Europa-Jupiter System Mission, produced by NASA / JPL News. Video: Hubble Directly Images Possible Plumes on Europa, produced by NASA's Goddard Space Flight Center/Katrina Jackson. Europa's position in space is within the powerful gravitational field of Jupiter. This strong gravitational "pull" has the moon locked into an orbit with one hemisphere constantly facing Jupiter. The elliptical orbit takes Europa alternatively closer to and farther away from the planet. This alternating increase and decrease of gravitational force on Europa results in the moon elongating and relaxing with each trip around the planet. This internal movement, combined with gravitational forces exerted by neighboring moons, produces internal friction and heat within Europa. Europa's internal heat could be the energy source that keeps the subsurface ocean from freezing and sustains any life that exists there. There could be hot water vents on the floor of the subsurface ocean that deliver energy and nutrients from the planet's interior. Organisms on Earth have been discovered in the subglacial lakes of Antarctica and in the hot ion-rich waters of hydrothermal vents. Life in Europa's subsurface oceans could be supported in similar ways. Europa from Galileo: An image of the trailing hemisphere of Europa. It shows very few impact structures but numerous ridges and fractures that suggest a rigid crust moving over a mobile layer below. Image by NASA. NASA gives three pieces of evidence that strongly support the presence of Europa's subsurface ocean. 1) Magnetometer surveys done by the Galileo spacecraft discovered an induced magnetic field near Europa's surface. This suggests a large body of conductive material (salty water) at a depth of 30 kilometers (about 20 miles) or less. 2) The surface of Europa has bands, ridges, fractures and multi-ringed impact structures that suggest the presence of mobile material below. 3) The surface of Europa has large-scale fractures and ridges similar to those that bound Earth's tectonic plates. These suggest a mobile layer below Europa's crust that supports the crust and allows it to move. A Window into Europa's Ocean Right at the Surface: Website article by NASA Jet Propulsion Laboratory, March 2013. Europa & Titan: Moons With Life? : Article from the Earthguide section of the Scripps Institution of Oceanography, University of California San Diego website, last accessed October 2016. 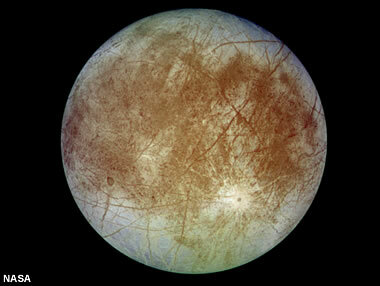 Europa Could Have the Ingredients Needed for Life: Article from the NASA website, March 2013. 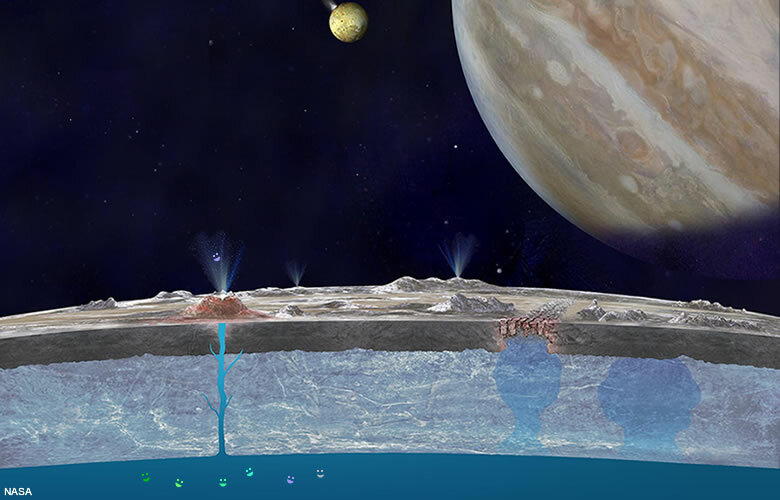 What Makes Us Think There is an Ocean Beneath Europa's Icy Crust? : Article from the NASA website, March 2013. The presence of magnesium compounds on the surface of Europa suggests that water from the subsurface ocean reaches the surface through springs or vents. If this occurs these eruptions would deliver up ions and microbes from the ocean below. So, if there is life in Europa's subsurface ocean, it could be scattered about the surface of the planet where landers or rovers might find it. A mission to the surface of the Europa might easily find evidence of life or even some of the microbes by sampling surface materials. This makes Europa a very interesting target in the search for extraterrestrial life. Some researchers believe that it is a much better target than Mars.